I have over the last year or so become a foundation junkie. The array of vitamin enriched, luminizing, matte, long lasting, velvet anti-aging foundations available can really boggle the mind. With every new release comes the promise of a flawless, porcelain complexion, that lures you in. Foundation is definitely subjective and should be chosen according to your own set of requirements and skin conditions (okay, I have tried a few *dozen* unsuitable candidates just to ‘see’ if it might be ‘the one’). Thankfully I do not have to look out for ingredient particulars as I am not too sensitive, other than oil-free which is more suitable for my oily skin. I do gravitate towards lighter looking foundations in warmer months. Finish: This gives my skin a perfected skin-like finish that has a slight glow to it, which allows it to look like skin. I find it covers all my discolouration and imperfections and can be layered for more coverage. My pores look softened and my skin fresh. It feels light on the skin. You will not get full coverage, so if you like that this one is not for you. It does have collagen boosting properties and other claims. My skin feels soft at the end of the day and looks well hydrated. 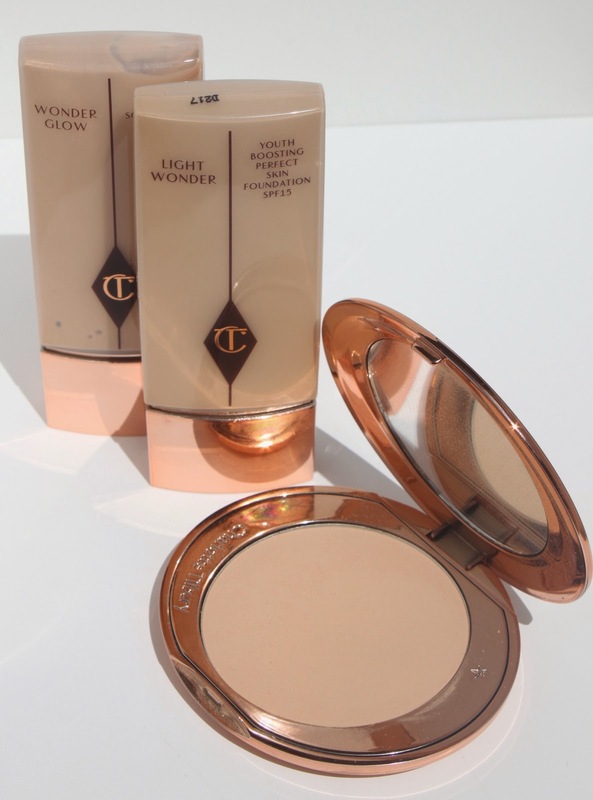 I have used this with a number of primers, with the best results being with the Charlotte Tilbury Wonder Glow. I’m not usually so matchy-matchy, but these work well together. Oil control is upped and longevity boosted. This is a golden hued primer, that once on the skin give a natural satin finish with no shimmer or colour at all. I have used it primarily with my CT Light Wonder foundation. They say you could wear it on its own, but I think unless you have 20-ish baby skin you will want to layer with your favourite foundation. It can be used over foundation, as a subtle luminizer on your cheek and brow bones. It can also be used mixed with your foundation as well. When doing this make sure the proportion of the Wonder Glow to the foundation is more to see any added glow. It does have a blurring effect, as my skin, lines and pores do look fresher. It is also packed with anti-aging properties so it adds to the effect of the CT foundation – so matchy-matchy works again in this case. It does not feel sticky at all, AND not heavy on that silicone ‘slip’ feel- more silky. This is a beautiful powder that I use to top my CT foundation. I chose shade two, which works with both shades 4 and 7. It does have a colour to it, but does not alter the foundation colour at all. It is my favourite powder to date (I do have Surratt on the way). It helps with oil control and while I can still get a shine, it’s not as mirror-like and can be powdered over while still looking sheer. This is in the same size packaging as the blush which I have reviewed here, but in a rosegold finish. It is insanely finely milled and I see a definite blurring of pores etc. It must be those sci-fi ‘nano particles’! Well… one kinda oops and then VICTORY! – I phoned the counter and asked lots of questions and got lucky! Hey Belly- thank you for the compliment." I love it when a plan comes together" – Mr T.